Officially known as the Commonwealth of Australia, Australia is the largest country of Oceania. It's the sixth biggest country on Earth in terms of physical size, covering an area of 2,969,907 square miles (7,692,024 square km) and has an estimated population of just over 25 million. Australia is made up of the Australian mainland, the island of Tasmania, and several other smaller islands. Australia was inhabited by indigenous peoples for thousands of years until the arrival of British settlers in the 1700s. The British initially established a penal colony on the area known as New South Wales, later colonizing other parts of Australia through the late 18th and early 19th centuries. The Commonwealth of Australia was formed on January 1, 1901, effectively giving the nation independent status. The capital city of Australia is Canberra, but its largest and best-known city is Sydney. Here are some overviews and statistics for the largest cities of Australia. Sydney is the state capital of the New South Wales Region, situated in the southeastern part of Australia. Sydney is the largest city in Australia, covering an area of 4,775.2 square miles (12,367.7 square km) and having an estimated population of 5.1 million. 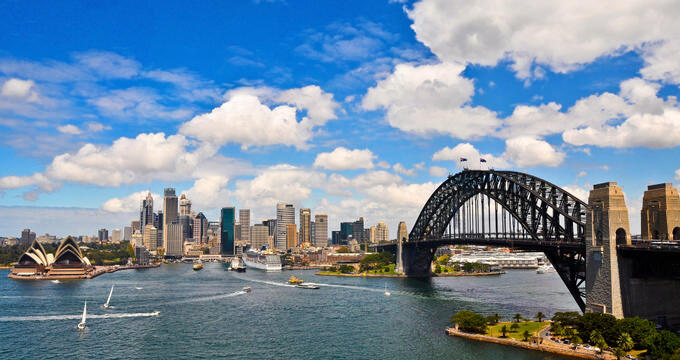 Sydney is also one of the oldest Australian cities, being founded in 1788 as a penal colony and named after Thomas Townshend, 1st Viscount Sydney, a British politician. This city is known for being one of the most-visited locations in all of Australia, with millions of visitors flocking to Sydney from all around the world to visit monuments and locations like the Sydney Opera House and the oldest library in the nation. This city is also home to more than 2.5 million acres of parks and reserves. Melbourne is the capital of the state of Victoria, which is located in the southeastern part of Australia, on the southern shore. After Sydney, Melbourne is the second largest city in Australia, covering an area of 3,858.1 square miles (9,992.5 square km) and having an estimated population of 5 million. Melbourne was founded in 1835 and named William Lamb, 2nd Viscount Melbourne, who was Prime Minister of Great Britain at the time. Melbourne was a key location for the British Empire, being known as 'Marvelous Melbourne' and transformed into one of the wealthiest and most developed areas in the country. In modern times, Melbourne is seen as the main cultural hub of Australia. Brisbane is the capital of the state of Queensland on the eastern coast of Australia and is the third largest city in the country. Built on the Brisbane River, the city covers an area 6,116.6 square miles (15,842 square km) and has an estimated population of 2.4 million. The city was named after Sir Thomas Brisbane, who served as the Governor of New South Wales for several years in the 1820s. Brisbane is one of the older major cities of Australia and is well-known as a major business and touristic center for the country, attracting many visitors for its unique architecture and historical sites, as well as many beautiful beaches and popular resort locations. Perth is the capital city of the state of Western Australia and is the fourth biggest city in the country. As the name of the state suggests, this city is located in the western part of the country. Perth covers an area of 2,478 square miles (6,417.9 square km) and has an estimated population of 2 million. The city of Perth was founded in 1829 by Captain James Stirling and became a city in 1856. It was named after a city of the same name in Scotland. Perth is a major touristic location and has close links with Mandurah, another major city in Western Australia; these two cities have formed one large conurbation in recent years, but are still classed as separate urban entities. Adelaide is the capital of the state of South Australia, situated in the south-central part of the mainland. Adelaide is the fifth biggest city in all of Australia, covering an area of 1,257.8 square miles (3,257.7 square km). It has an estimated population of 1.3 million and has the unique distinction of being home to more than 77% of all South Australia citizens. Adelaide was named after Adelaide of Saxe Meiningen, the wife of King William IV of the United Kingdom. Whenever cities are ranked in terms of quality of life, Adelaide often breaks into the top 10 and is classed as one of the best cities in Australia in which to live and work.